Memorial mob merchants are a group of vendors in Sekiro: Shadows Die Twice. They show up at locations where there have been a lot of deaths, and sell offerings for the dead. Some of the items they sell are pretty useful, like new prosthetic tools. 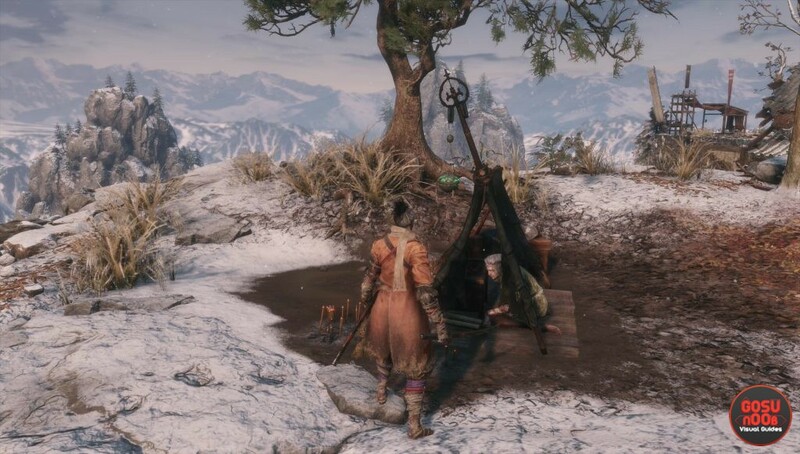 If you’re wondering where to find them, this guide will show you all Sekiro memorial mob merchant locations – crow’s bed, battlefield, dungeon, Shugendo. You’ll find the first one in the Ashina Outskirts area. After you defeat the first mini boss, General Naomori Kawarada, climb on top of the eave above the gate. If you look to the left, you’ll see a tall mesa by the road. The vendor is on top of it, and there’s a grappling hook anchor on the other side, which you can use to get there. This one is accessible after the first proper boss fight, the one with Gyoubu Oniwa. Go to the battlefield where you fought the boss, then climb up the stairs and turn right. Hug the right wall until you find another set of stairs on the left. Climb it, and you’ll find your merchant. When you find him, he’ll offer to sell you Dragon’s Blood Droplet, Antidote Powder, Fistful of Ash, Light Coin Purse, Heavy Coin Purse, Robert’s Firecrackers and a Gourd Seed. This one is right next to the Abandoned Dungeon Entrance idol, in Ashina Castle. To get there, spawn at the Ashina Castle idol and jump across the chasm from the bridge. Cross the other bridge and climb onto the massive gate. You’ll see an opening in the wall across the courtyard. Go through it and turn left immediately. If you want to do business with him, you can buy Pellet, Dragon’s Blood Droplet, Contact Medicine, Mibu Possesion Ballon, Light Coin Purse, Heavy Coin Purse, Mask Fragment: Dragon and Prayer Bead. This vendor is in the Senpou Temple area. You’ll find him atop a cliff near the Shugendo idol. To get there, start from the temple courtyard and head to the broken bridge. Look up and to the left, and you’ll see a cave mouth. Use the grappling hook to get inside, and follow it to the idol. The scaffolding on the left will lead you to the merchant. Here’s a list of items he sells: Persimmon, Dragon’s Blood Droplet, Ako’s Sugar, Ungo’s Sugar, Five-color Rice, Light Coin Purse, Heavy Coin Purse, Bulging Coin Purse, Scrap Magnetite. You’ll find this merchant in the Ashina Depths, near the Mibu Village idol. If you haven’t reached it yet, you’ll have to defeat the Mist Noble mini boss at the temple in the forest. You can get to him by dropping down from the roof. After that, go behind the temple, past the lanterns and to the cliff. Drop down to the left, and keep dropping until you reach the ground. The idol and the merchant will be there. As far as his inventory is concerned, he has Pellet, Mottled Purple Gourd, Gachiin’s Sugar, Heavy Coin Purse, Bulging Coin Purse, Adamantite Scrap, Dragonspring Sake and Treasure Carp Scales. This one is in the Sunken Valley area, near the Bodhisattva Valley idol. Spawn there, then use the tree branches to drop down into the green, poisonous muck. Follow the path up to the first crossroads. Turn right there, and you should see the vendor’s tent immediately. He can sell you Pellet, Dragon’s Blood Droplet, Green Mossy Gourd, Antidote Powder, Heavy Coin Purse, Yellow Gunpowder. Where exactly did you find him? I didn’t knew he appeared as a merchant and went looking for him but I don’t know where is him. I’m so late in the game by now. dude that’s not the samurai that fights the drunkard with you stop spreading misinformations. No, different npc all together. The dept npc is at the shrine now and the dude from the drunkard died in my game. Please dont misinform. And there is also a Carp Scale Trader to the right of the first Hirata Idol. On a little island in a blue pot. A magic pot!!!! There’s a merchant near the Sunken Valley: Bodhisattva Valley (just before the guardian ape). To get to him you have to turn around and jump down the cliff (you can grapple a tree on your way down). There’s an area with poison pool. Follow the path after the monkey and on your right you’ll find him at the entrance of a cave.